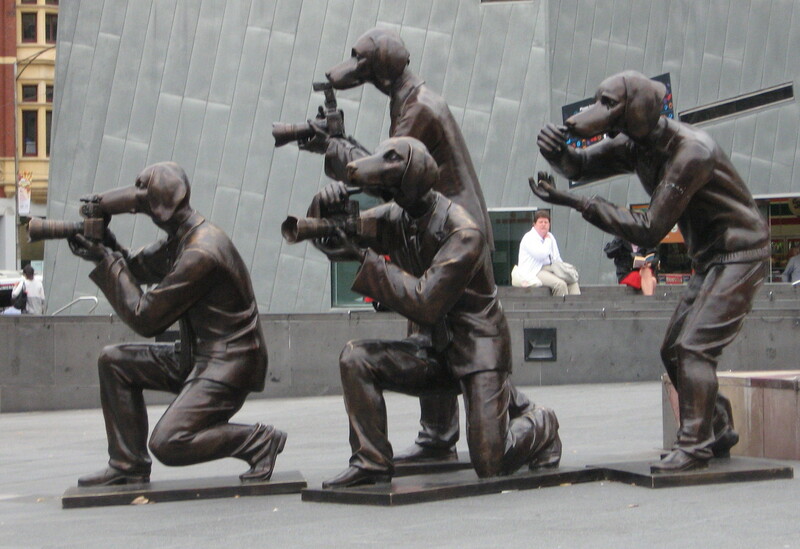 These are called ‘Paparazzi Dogs’ but I reckon they are a pack of puparazzi’s. If you want to find them, it’s too late. They have been and gone, as good puparazzi’s would, with the shout of “Which way did they go?, which way did they go?”. These life-size sculptures are by international award-winning artists Marc and Gillie Schattner. These dog/human hybrids celebrate the powerful relationship between man and animal. The Schattner’s dream is to bring art out of the galleries and museums and into the public realm. As husband and wife, Gillie and Marc met in Hong Kong. Gillie was a nurse from England and Marc, a boy from the ‘burbs’ of Melbourne, Australia. They married seven days later at the foothills of Mount Everest. According to their website, they not only share an unsurpassed dedication to their art but also love for their two children, and their mutt, Moby. With a 20 year history of collaboration, with both painting and sculpture, they have received worldwide acclaim and are held in collections both nationally and internationally. For further details, check their website. This entry was posted in Sculpture and tagged bronze, Gillie Schattner, March Schattner. Bookmark the permalink.